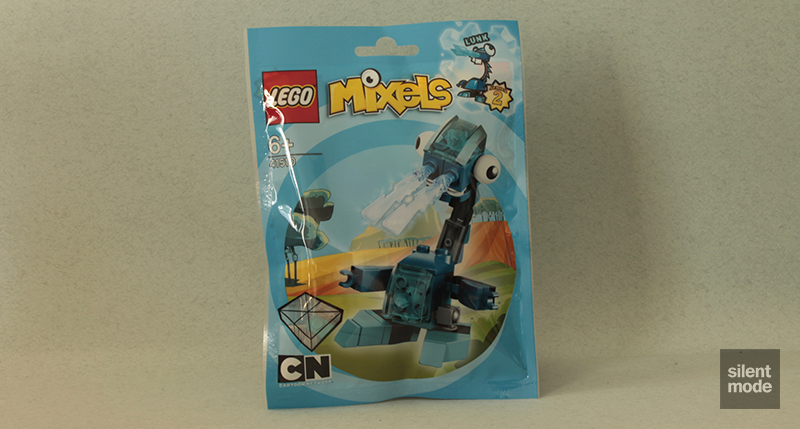 Welcome to the second Mixels Series 2 review, and this time we’re paying a visit to Lunk, another Frosticons tribe member. Immediately noticeable is Lunk’s long neck, which up until now hasn’t been seen on a Mixel… so immediately this one stands out from the rest. Who am I kidding? The first thing we notice is that Lunk seems to have a bad case of frozen snot… and I don’t mean the building technique! Lunk is the first Mixel we come across to have Medium Azure cheese slopes, which I’m very certain are going to become popular – not just for MOCers and hoarding purposes, but for anyone who has suddenly gotten into making mosaics. We also get a few more of those small plates in Medium Azure, and three cheese slopes in Trans Medium Blue. Right at the back are two Trans Medium Blue “lightning” parts, again looking as if they come from Ninjago, which turn out to be rather difficult to photograph properly. We get two in this set, as opposed to Flurr who has just one. 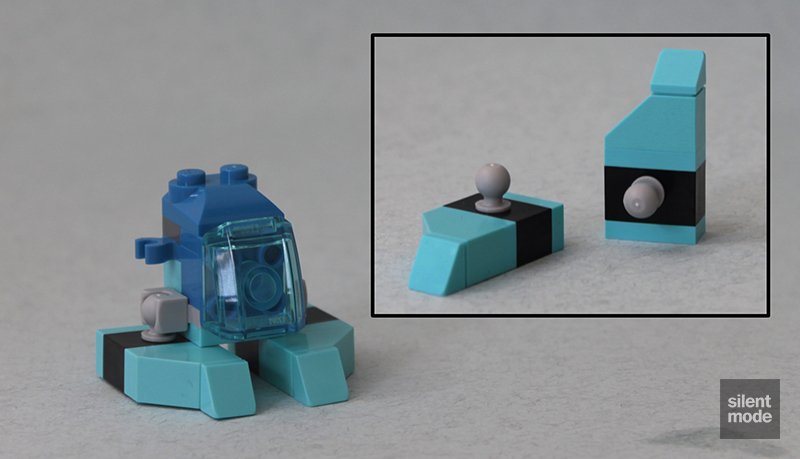 Also making an appearance are two “baby bows” and four 1×1 single stud SNOT bricks in Blue, two of those printed ball parts in White, and three different kinds of the new joint parts. Moving swiftly past the initial stages – again building the “core” – we end up giving Lunk similar “legs” (or rather big feet) to Zorch. This time, however, I think they’re suited. Lunk’s arms only have one point of articulation, which you might or might not like. The neck is built using a combination of hinge plates and cheese slopes, with one of the new joint parts used to attach it to the body. No Lunk can make it to market without being caught in mid-sneeze, because regulations specify the ice has to form a certain shape. Other than that, the jury is out on what role Lunk plays in the Mixels universe: maybe it’s an incredibly lazy Mixel who serves as the last line of defence should Nixels try to invade the Frosticons’ territory, as it doesn’t like to move around very much. Who knows? We’re left with easily the most useful combination of spare parts for the Frosticons. Lunk is currently up there with my favourite Mixels builds so far, and definitely has a useful assortment of parts should one wish to obtain multiples. I particularly like that the mould was broken with this Mixel having a long neck as a play feature, although playability suffers from the use of stepped hinge plates – rather than the newer joint plates or even clip/bar plates – for articulation. Along with the short arms, which you might or might not think are necessary, this is one that leaves itself wide open for modification. I’m giving this one 6.4/10, based on how it comes.